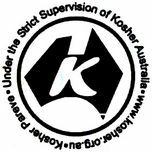 1975: Mizrachi Kashrut founded as a communal body for kosher supervision. 1994: Mizrachi Kashrut merges with Rabbi Mordechai Gutnick's Kashrut activities. ====.The resulting organisation is renamed Melbourne Kashrut.